Pasquale “Pat” Croce has a tough time sitting still. He ascribes the condition—and, for that matter, much of his extraordinary success—to a persistent case of attention deficit disorder. Whether it’s driven by ADD or merely a superhuman energy reserve, Croce’s state of perpetual motion has sculpted not only his body but also his personality. It’s molded him into a highly charismatic chameleon, with a revolving door of professional triumphs. He’s been, in turn, personal trainer for the Flyers and Sixers, bestselling author, reality-TV star, consumer-products maven, chief executive, museum curator and karate champion. At 56, after a lifetime of rigorous exercise, his frame still has more in common with a 6-foot, 165-pound length of steel cable than somebody’s grandfather, (though that is, incidentally, another of his titles). Croce attributes his achievements not only to his fitness level but also to his ability to move efficiently from one project to the next. Among them: The ambitious decision to relocate his St. Augustine Pirate & Treasure Museum to Florida’s northeastern coast, from its original home in Key West. ?Also forthcoming is Croce’s latest book, The Pirate Handbook, (Chronicle Books), a guide to surviving as a pirate. 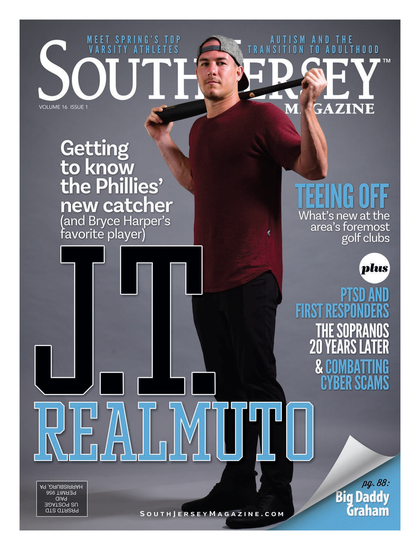 SOUTH JERSEY MAGAZINE: Unlike you, many Americans struggle with fitness, obesity and poor health. What’s the hang-up? PAT CROCE: It takes discipline to get up and work out every day or even four days a week. You have to put in the schedule and adhere to it, and some people are just lazy. I’m not saying you can’t have a doughnut; I don’t say to anyone you can’t have anything. I’m all about what you can have. My mission was always moderation; that was the message. You don’t have to be a marathoner. You don’t have to be a triathlete. You don’t have to be a vegan. But you do have to commit some focus to your body: nutrition, fitness and sleep patterns. It’s all three, because if you’re only getting five hours a night, you’re not going to be fit. SJM: Have you always had this passion and energy, or did you have to cultivate it? PC: The passion and energy have always been there, whether it’s ADD or just the excitement and enthusiasm for life. But I’m one who preaches you should take action on your passion. What people don’t know is this: I only do what I’m passionate about. I like fitness. I like being fit. I hate being injured, and I get injured because I do something too hard or train too excessive or do something crazy and blow out my elbow or get in a motorcycle accident. I really only do what I like, whether it’s public speaking or fitness or getting involved with pirates. Pirates, I love—the history, geography and science of that golden age of piracy, the democracy. That was a precursor to the American Revolution back then; people don’t know that. Mother England hated these pirates because they were democrats. There was a democracy there; they voted that captain into office. … I’m not good with authority. And I don’t believe that this class system, because you have money, that you should be put on a pedestal higher than me. And that’s how it was; you couldn’t get out of that class system, but a pirate could. You could be an ex-slave and be a captain, like Black Caesar. SJM: As a motivational speaker, your message certainly resonates, but at some point people have to take action on your message. PC: I believe people should be able to achieve whatever they dream. Now, it’s not just believing in it and dreaming it; you have to set a strategy, a game plan, get a mentor, bypass the mistakes and get that learning curve down so it’s pretty flat…. You have your vision, whatever that vision might be, and you break that vision down into short-term, time-sensitive goals. You take each goal and break into down into strategies. You take each strategy and break it down into tasks, and that’s what goes on your to-do list.… Until you [actually begin doing those tasks], it just becomes a dream, not a vision. Action is what you’re talking about; it’s fitness. I’m going to outperform most people because I have the endurance and the oxygen, not only going to my body but to my brain. It oxygenates everything—including your creativity. SJM: Some people might say you’re just wired differently. Why do you think that is? SJM: Moving the museum must have been a tough decision. PC: I’ve been there five years, and you realize the people who loved it really loved it. But when you go to Key West, you go to party, first and foremost; our bars down there are doing great—the Rum Barrel and Island Dogs. Secondly, you go for water activities, and third you’ll go to Hemingway’s or the Butterfly Museum or Pirate Soul [his museum’s former name]. But that wasn’t good enough. Families loved it, but there weren’t enough families. At the most we would get 20, maybe 30 school groups. In St. Augustine, I already have hundreds of school groups scheduled. It’s a totally different dynamic; the pedigree of St. Augustine is history. You go there, first and foremost, because of history. My museum is relevant there. SJM: You’ve got so many projects in the works, including a producer’s credit on the forthcoming film The Mighty Macs. Do you choose projects based on your interest, or because you recognize good business opportunities? PC: All of the above. In college I was a phys. ed. major who wanted to be physical therapist when physical therapy was not in vogue. And at the same time, I saw during my internships that physical therapists and athletic trainers … hated each other. So why not get the best of both? Then I came up with this concept that helped breed what you now know as sports medicine. I didn’t invent sports medicine, but I was the first to have a sports medicine center in a hospital in the United States, at Haverford Community Hospital. From there I branched out only because the hospital got complacent. We were doing so well, but I just wanted more. I’ve always wanted more; when I left the Sixers it was because I wanted more. I’m not good at the status quo. SJM: You’ve also invested in consumer products, like Skinny Water. You haven’t been afraid to try new things. PC: Some investments work and some don’t. You just have to hope the ones that do outweigh the ones that don’t.… I’m not afraid of failing at all. What’s failing? People need to remove that word from their vocabulary. There’s no such thing as failing…. One thing about me might surprise you: If it’s difficult, I’m not going to do it. It wasn’t difficult to leave the Sixers. It wasn’t difficult for me to sell [Sports Physical Therapists, his chain of sports medicine centers] to NovaCare. I’m driving a car in this journey in life, and I have a real little rearview mirror that I look at to learn from and to enjoy the memories. But I’ve got this giant windshield where I see a horizon and that rainbow, and one day I’m going to hit that pot of gold. I’m not one to have regrets. Like I say in my speeches, don’t smell like “should.” Wipe the “should” off yourself. Forget “should.” If you should do it, then do it. SJM: You’re also a prolific author. Where do you find the time? PC: Sundays are my creative time. Saturdays, too—but I’ve always been a fanatic about working on Saturday mornings. Anyone who reports to me has to have a five-15 in to me by midnight on Friday night—a report that takes 15 minutes to write, five minutes for me to read—it’s a weekly update for what they’ve accomplished and major goals for the following week. When I wake up Saturday morning early, I’m going to have a lot of five-15s to read, and I go over every one of them. SJM: Your many careers have taken you around the world. Why have you chosen to stay local? PC: I love Philly. I love the people, and it’s close to the Jersey Shore. [Croce spends his summers in Ocean City]. I was out in Hollywood when I was doing Pat Croce: Moving In [a reality-TV show]—I lived out there for six months—and I have a home in Key West, and I’m building an apartment in St. Augustine above the museum, but Philly’s my home. This is where I was born and bred, and I just feel comfortable here. SJM: What aren’t you good at? PC: I believe we’re [each] blessed with a certain skill set, but I’m not happy that I can’t write music like Bruce Springsteen. I just happened to be a good fighter—a street fighter—even though I was a babyface. Being a black belt, you learn something when you watch everyone become a white belt. When I started karate, a lot of these white belts didn’t know how to make a fist. But some of them who became black belts, if they made it through that three or four years, their variance from where they started may have been better than mine. That transfers to everything in life; it’s all how people use the skill sets they’ve been blessed with. I’m still trying to make sure I’m utilizing the talents I’ve been given. I’ll try anything; I tried yoga, and I just started that a year ago.… Actually, yeah, there’s one thing I would say I’ve failed at: I can’t meditate, even when they meditate at the end of yoga. I love the working-out part, but the chilling-out part at the end—that’s not for me.